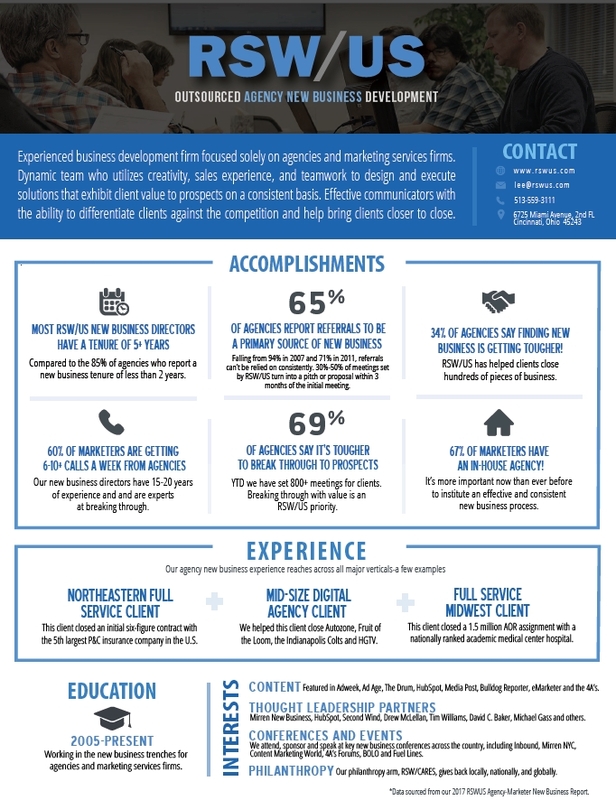 We are RSW/US, the Nation’s leading outsourced business development firm expert in driving closed business through multiple channels for the small to mid-sized agency. Our background includes twelve years solely focused on driving new business for agencies and marketing services firms. Previously (in our first several years), we worked predominantly with full-service agencies across the country to secure qualified meetings for clients with right-fit prospects. Since then, while our focus is still on acquiring qualified meetings for agencies of all types across the country, our main goal has shifted – and is now centered on getting clients closer to close, and it’s paid off. Clients closed over 60 pieces of business last year. A marketing team that serves as an extension of your new business efforts. We’re confident we can work as part of your team to help you drive and close more business in 2018. Please call or email our VP of Sales, Lee McKnight Jr. (lee@rswus.com/513-559-3111) or our Owner, Mark Sneider (mark@rswus.com/513-559-3101), to arrange an interview. Thank you for your time—we look forward to a potential conversation!